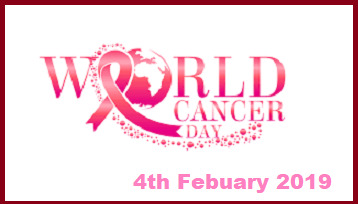 The World Cancer Day (WCD) is observed every year on 4 February around the world to spread awareness of cancer and to encourage its prevention, detection, and treatment. Its primary goal is to reduce the illness and related deaths by 2020. The World Cancer Day (WCD 2019) theme (tagline) for this year is "I am and I will" - all about your story and your commitment. On this day, nationwide campaigns targeted to cancer patients and several events and functions are held to raise the awareness regarding cancer and it dangerous effects. The WCD was instituted by Union for International Cancer Control (UICC) in 2008 by formally writing goals of the World Cancer Declaration. The primary goal of observing the day is to reduce illness and death caused by it by 2020. The origin of the day can be traced to 2000 at the first World Summit Against Cancer, which was held in Paris, France. UICC is Geneva-based leading international non-governmental organisation (NGO) founded in 1933. Its purpose is to help the global health community to accelerate the fight against cancer. It has a membership of over 800 organisations spread across 155 countries.